Wet It! wonderful Swedish super absorbent cloths far outperform regular cotton rags, paper towels and sponges because they are so light and absorbent. And unlike our competition, Wet-It! lasts for up to 6 months! When moistened, they soak up any mess and leave a squeaky clean surface behind. They are so versatile! Wash dishes, wipe your counters, polish chrome, dust, wash windows and even shine your mirrors with these cloths and you will never want to go back to using cotton rags, paper towels and sponges. Soak up water to leave any surface streak-free and no drying is needed! And even better, they do not smell. Wash and use over and over again. You will save on paper towels and no more stinky cloths! Although common in Sweden, Wet-it! cloths are new to the American market, but they are quickly becoming a "must have" item for every home. On average, one Wet-it! cloth easily replaces 16 or more rolls of paper towels because it's reusable and absorbs up to 15 times its own weight! It's great for non-abrasive jobs too like polishing silver and can clean windows or gently dry glassware, giving a streak-free shine without lint residue. Wet-it! is even gentle enough to use on a baby. Create your own favorite use! 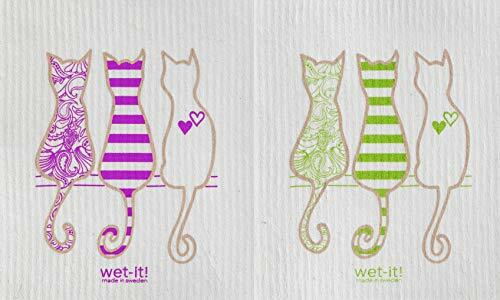 Made of 70% cotton and 30% cellulose, Wet-it! cloths are soft to the touch, yet strong and durable for long-lasting wear. Along with the cloth's extraordinary eco-friendly composition, the colorful print is infused into the cloth using watercolor based dyes to ensure a design that doesn't fade with use - even when using bleaching agents. The cloth is 100% biodegradable and breaks down within six weeks in a home compost or 16 weeks in a commercial landfill. Before you get to that point, you can easily and repeatedly clean and disinfect the cloth in the washing machine, in the top rack of the dishwasher or by placing it wet within the microwave for 2 minutes. Note, when cleaning in a washing machine, fabric softeners will break down the fibers. This colorful Swedish dishcloth is incredibly functional and long lasting; perfect for kitchen, bathroom, nursery, outdoors or anywhere something needs to be wiped up. Super absorbent wet it dishcloth can hold up to 15 times its weight; durable and strong, yet soft and non-abrasive. Made of 70% Cellulose and 30% Cotton. If you have any questions about this product by Wet-it!, contact us by completing and submitting the form below. If you are looking for a specif part number, please include it with your message.